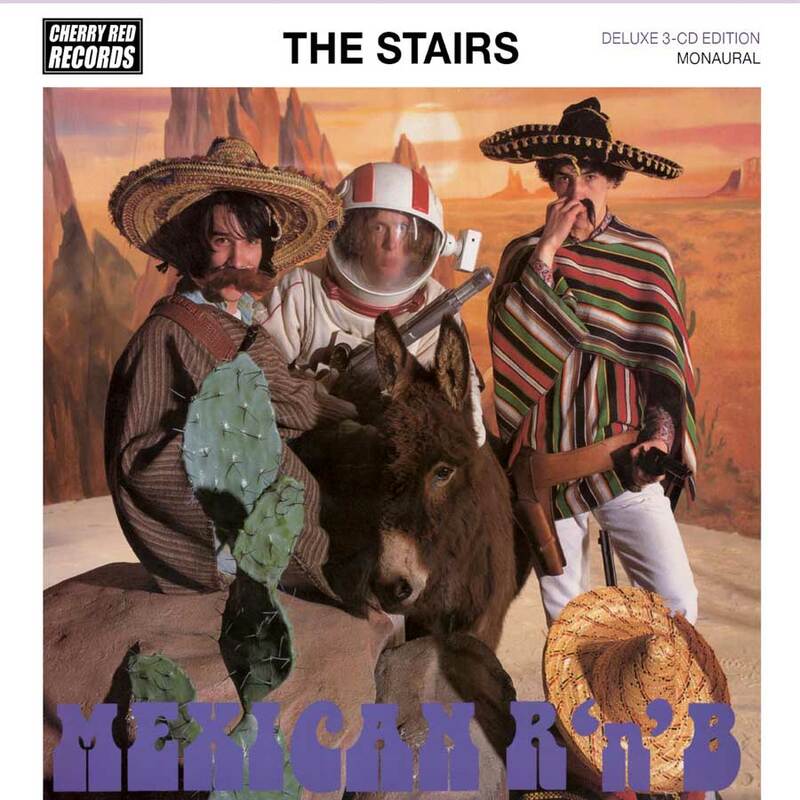 One album that has been crying out for someone to pick up the re-issue baton and bring it back to the public music consciousness for a long while now is the supreme and cosmic “Mexican R n B “ by the Liverpudlian quasi equivalent of a west coast garage band; the one and only The Stairs . The collection offers a pothole back to a interesting period in 1991 – 92 when a real crop of great bands were emerging – caught between the dying embers of the Madchester boom and the soon he be embracing of all things grunge and Seattle by the music press. The collection opens with the classic album in its original sequence along with the additional tracks and B sides from the first few EP and single releases. The opening stomp of ‘Mary Joanna’ straight in to ‘Mr Window Pane’ reaffirms the fondness felt and high regard this collection of songs is still held by so many a few decades later. Two songs in particular at the opposite end of the scale capture the essence of the record and a trip through Edgar’s song writing better than any. Firstly the heartfelt melancholic saccharine ode to love, ‘Sweet Thing’ sang in the unique tones & vocal style of Edgar Summertyme has never sounded better, pair that with the bombastic sonic workout of ‘Right in the Back Of My Mind’ – a blueprint song that could sit very comfortably in the set of any of today’s current crop of psyche scallydelic groove merchant’s. The early 90’s were filled with songs about innuendo and druggy word play – ‘Weed Bus’ got straight to the point, one of the greatest singles released of the era surely? A classic Edgar lyric and a window in to his own nuances of youth culture and of a lifestyle & care free attitude that so many can could relate too. The second part of the collection opens with the ferocious and crunching cover of the Del-Vetts ‘Last Time Around’ which was the fourth single the band released and formed the EP released on Imaginary Records – a interesting second EP ‘Fall Down The Rain (surf)’ for the same record label which up until now had remained unreleased also features on the collection. There is a whole host of Stairs favourites featured in a array of alternate takes – early ideas and intriguingly a version of ‘Flying Machine’ recorded on a porta studio in Edgars mum’s back garden. The Stairs were never shy of wearing their influences and record collections boldly on their sleeve and conveying them in to their own sweet sound – One of the real highlights on this set of Mexican R n B out takes is a wonderful tune ‘I Can Give You Everything’ a tailor made cover version I discovered through listening to this collection was originally by a young Van Morrison and his superb mid sixties R n B outfit Them, a band that Stairs had previously referenced on the reunion shows a few years ago using ‘Gloria’ to great effect in the live set . The final and most eagerly awaited part of this collection is the third disc which is in the main part the follow up album that never was. Listening to this set of songs it is astonishing to think that they have criminally sat in a vault unheard – it is also apparent when hearing the playing on these how far and special this thing may have been in a different musical climate and head space within the band – the ideas and nucleus of a bigger Stairs sound can be heard with the breakaway from the traditional 3 piece and the use of horns & organs permeating this richer sound. Opening with the heavy opener of the Hendix-esque pomp of ‘Skin Up’ – a real Stairs wall of sound monster which is the first to showcase the interplay and progressive twin guitar playing by Ged Lynn & Edgar which is an ongoing theme and adds to the expansion of The Stairs sound throughout this proposed follow up album. The magnificent cool of ‘Saw Her Today’ effortlessly slips in to my top 5 Edgar penned tunes after only a few listens, ‘Gotta Reason’ sounds like the first creative seeds of Edgars doo woo lounge phase he started on ‘The Soothing Music’ album and ‘Talking To You’ with its ace harmonies is like a Scouse offspring of Martha Reeves – Heatwave. Box set re-issues can some times be a bloated padded out trawl – This collection is a absolute listening trip and triumph essential for Stairs aficionados.